General surgery resident Lane Frasier, MD, MS, has been selected to receive the prestigious Jameson L. Chassin Award for Professionalism in General Surgery from the American College of Surgeons (ACS). 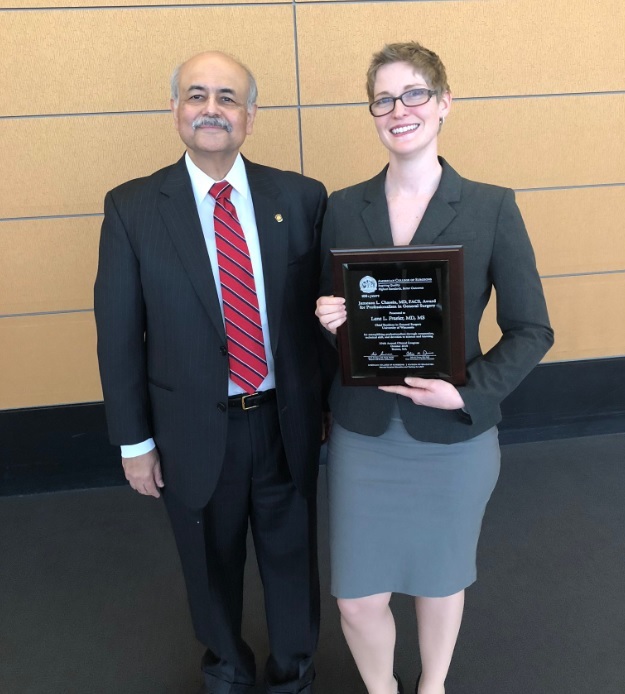 The competitive national award is given to one chief resident who best exemplifies the professionalism values of compassion, technical skill, and devotion to science and learning. She will be presented with the award on October 24th at the 2018 ACS Clinical Congress in Boston. Dr. Frasier attended Michigan State University, where she graduated with high honors through the Lyman Briggs College and the Honors College with a bachelor’s degree in microbiology. She went on to medical school at the University of Michigan where she developed interests in general surgery and health services research. During her research years in the Department of Surgery, Dr. Frasier obtained a Master of Science in Population Health, as well as certificates in Patient Safety and Clinical and Community Outcomes Research. She spent three years conducting research on human factors in the operating room, working with Dr. Caprice Greenberg and Dr. Douglas Wiegmann through the Wisconsin Surgical Outcomes Research (WiSOR) program. Her project, “Human Factors Analysis of Team Fluidity in the Operating Room” was awarded an F32 grant from the Agency for Healthcare Research and Quality. Dr. Frasier receiving the the Jameson L. Chassin award for professionalism in surgery from the American College of Surgeons. Her focus was to evaluate teamwork and communication in the operating room, investigating how familiarity between team members influences the effectiveness of their communication. She hypothesized that in a context of unfamiliar team members, there is a need for increased verbal communication. 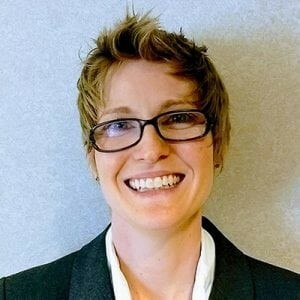 During her residency, Dr. Frasier received multiple awards for her educational, research, and clinical knowledge including best clinical paper at both the 2016 Department of Surgery Research Summit and the 2016 Wisconsin Surgical Society Annual Meeting, the Resident Educator Award in the Department of Surgery and an Association for Academic Surgery Research Fellowship Award, a major funding grant. Congratulations to Dr. Frasier on this impressive and well-deserved honor.